As discussed in some of my previous articles, and in my book, Polar Wandering and the Cycle of Ages, Charles Hapgood’s theory of Earth Crust Displacement (ECD) actually originated in the nineteenth century. For those unfamiliar with Hapgood’s work, he claimed that Ice Ages come and go due to the earth’s ‘crust’ (lithosphere) sliding as a whole over the fluid layers below, in the asthenosphere, moving places in and out of the polar regions. It is now common knowledge that Einstein supported Hapgood’s theory. But what has been totally forgotten, even by the most devoted pole shift enthusiasts, is that the theory was first properly developed by the President of the Geological Society, Sir John Evans, back in 1866. (I will keep mentioning this fact in every single article I write, so that hopefully all the internet pundits catch on.) Astonishingly, even Hapgood appears to have not known about Evans’ work, as he made no mention of it in Path of the Pole, where he wrongly claimed that the idea was first proposed in the early twentieth century. But it’s about time to pay homage to another great man, who developed an even earlier, less comprehensive theory of ECD way back in 1847: Frederik Alexander Gottlieb Klee. He has also been forgotten, and I only came across his work after years of painstaking research digging through dusty old books. Neither Hapgood nor any published authors on the subject of ECD have mentioned him, and none of the internet commentators either. Klee was the son of a Russian Army officer who fought in the Napoleonic Wars. Young Klee studied Law at Copenhagen University, and by 1952 had become a justice councillor. He worked in a very senior position in the post office for many years, developing modern systems of communication, including the telegraph. 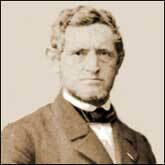 Later he gained high office as the Danish financial administrator for the railroads. A true nineteenth-century Renaissance man, Klee also studied geology and ancient history. 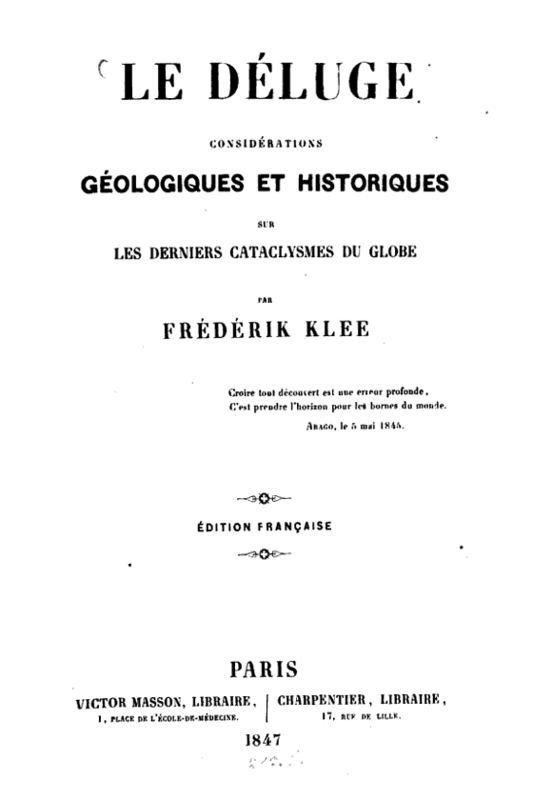 He went on to publish, in French, Le Deluge: Considération Géologique et Historique sur les Derniers Cataclysmes du Globe. A contemporary of Charles Darwin, Klee was also a controversial figure in his day. In Le Déluge he presented his ideas about how the planet was originally formed, and also reviewed some of the earlier theories on the Great Flood. But alas, much of the above quote is still applicable to the state of science today; there is still a blind adoption of ideas that scientists and the public alike feel no need to examine, such as the assumption that Ice Ages are caused by a lowering of global temperatures. And in turn this idea is based on the assumption that the earth’s crust does not slide slide around as a whole – it is simply taken for granted that it doesn’t. As Stephen Bywater explains in his hilarious book Lost Worlds, each era is defined and shaped by its assumptions, and our own era is no different. Regarding the Great Flood, Klee was highly critical of some of the earlier, fanciful theories of scholars, which he believed were based on excessively literal interpretations of the Bible. But he was more interested in some of the later theories, such as one proposed by an abbot called Pluche, who “claimed that the deluge was caused by a displacement of the earth’s axis accompanied by a subsidence of the earth’s surface”, in a book called Spectacle de la Nature, published was back in 1739! So this is, if you like, a proto-theory of polar wandering, and the father of Earth Crust Displacement is an eighteenth century abbot! Although Hapgood did not discuss The Great Flood in his book Path of the Pole, he did claim that the last crust displacement moved North America southward by 30 degrees, initiating meltdown of the Laurentide Ice Sheet and the consequent rapid rise in global sea levels. This meltdown is claimed by many researchers to be the source of the worldwide legend of a Universal Deluge. So Hapgood’s ideas do correspend in that respect with Klee’s. As I discuss in my forthcoming book, Polar Wandering and the Cycle of Ages, Klee showed how the traditions of many ancient cultures mention a change in the orientation of the sky, coincident with a shift of the earth’s crust. This may still be a highly unexplored idea, but it promises many years of fruitful research. It should be taken at least as seriously as flood mythology, which many respected scholars have concluded is a recollection of those tumultuous, watery perils at the end of the Ice Age, when the great ice sheets of North America were move southward by the last crust displacement.